Network LookOut Administrator Pro 3.8.17 - Download Win Apps. See their screens and take a control by controlling the mouse and keyboard.. 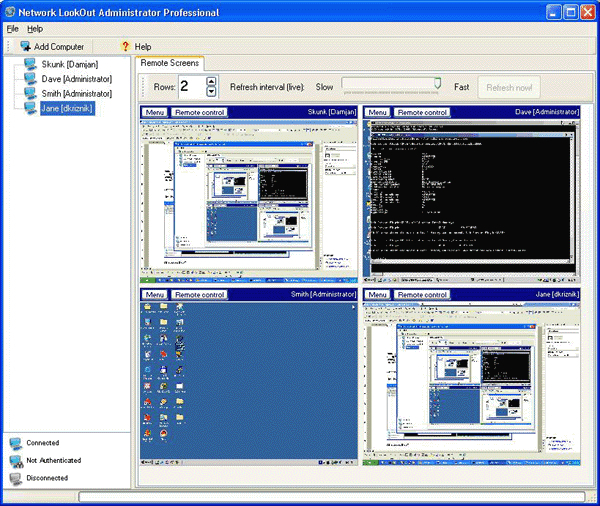 The NLOAP allows you to see live screens of remote computers. This way, you can always watch what users are doing on the remote computer. Additionally, you have the ability to take control of a remote computer by controlling the mouse and keyboard; this is especially useful when you need to assist the person who uses the remote computer. If you are an administrator, you can easily administer remote computers. Alchemy Network Monitor monitors your network servers and business-critical applications availability and performance and immediately alerts you if a server gets out of order. Alchemy Network Monitor can also perform certain actions (e. g.